Custom printed speakers are a great way to make your brand known. They offer a creative outlet for business owners to promote their brands in a fun and remarkable way. Absolut Vodka‘s on pack branded speaker is one good example. 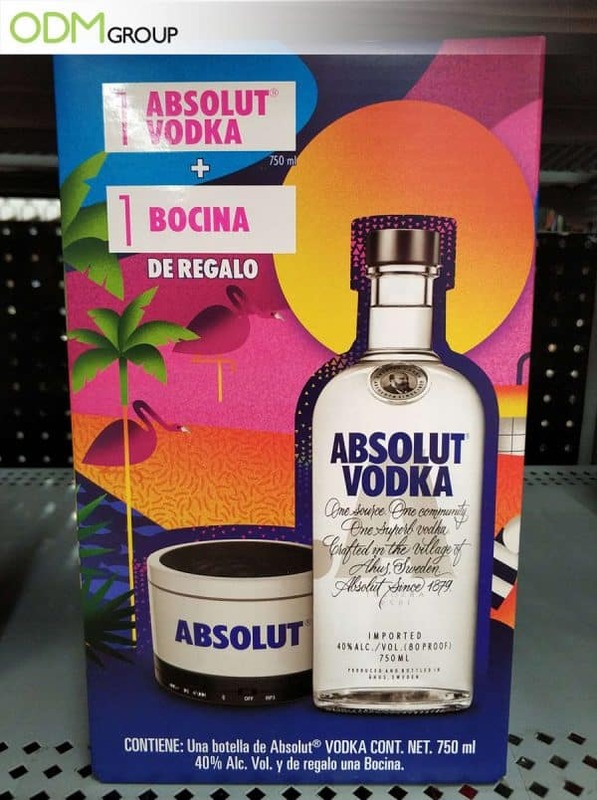 This on pack promotion by Absolut is certainly an absolute hit because the gift is timely, practical, and nicely-branded. The colorful flamingo packaging is a nod to the culture of the people they are marketing to. But why custom branded speakers? Parties and gatherings are not complete without music. Thus, not only does the brand incentivize consumers for their purchases, but they also promise to create a better and livelier drinking experience to consumers. It’s also worth-noting that their target audience are fond of merriment; festive music, and dancing! 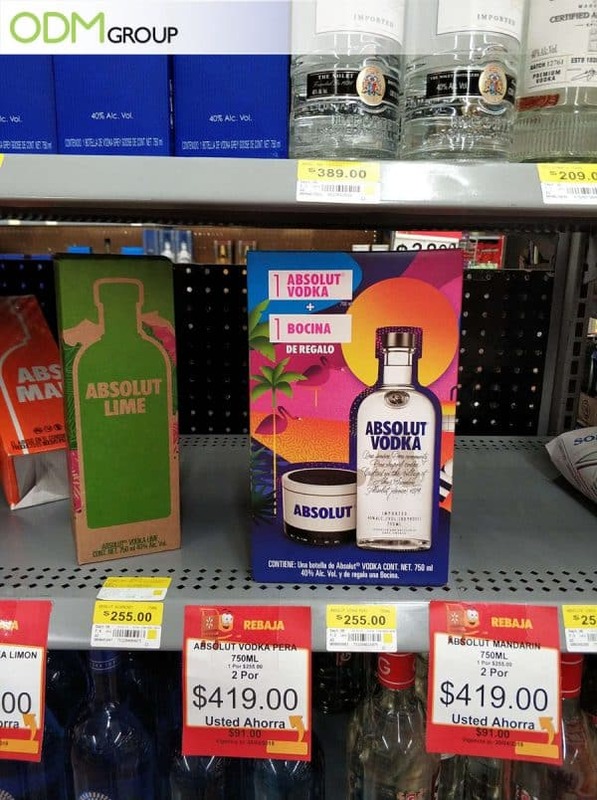 Branding: In terms of brand positioning, we can say that Absolut did great. Today, wireless portable speakers have replaced the large wired ones. This inspior So, branding their promotional speaker positions their brand as something that is fun, modern, and relevant. Additional Value: Electronic gadgets and speakers are great addition to your campaign because such items are deemed high end. As such, they effectively increase the products perceived value so people will more likely to buy your products. These promotional speakers are would make excellent corporate gifts for clients and customers alike. Due to its size, users can easily keep them inside their bags and take them during trips, outdoor gatherings, and outings. Place them on their office desk or study table at home, for better brand visibility 24/7. To make greater impact, merchandisers should use a custom POS display dedicated solely to their products. In this picture, you’ll see that the shelf is almost empty and this affects how the brand is perceived. One, it creates a sense of urgency, therefore compelling shoppers to buy this last piece. Two, the almost empty shelf could make the product look unwanted. We suggest creating a POS display unit or a free standing display that matches with their packaging. When customers see their in-store display, they’ll be drawn towards the products on display. Indeed, Absolut Vodka was ableto promote their brand in a way that resonates with their target market. They indeed took into consideration the culture of the people, which is evident in their drinks packaging design and on pack gifts. Designing and manufacturing your brands doesn’t have to be a stress fest. Here at The ODM Group, we can help you design, source, and manufacture custom branded merchandise for drinks. If you have a design concept in mind, do send us an email so we can get started with your project. Or, if you like your products designed in-house, our Mindsparkz team is always here to help you out! If you want to see more marketing and design ideas, browse through our blogs. This branded cooler box with speakers is the ultimate promotional gift for summer promotions, events, and drinks promos. Not only will you keep drinks cold all day long, but you also get to play cool music! Being wireless, custom bluetooth speakers are perfect for outdoor activities such as picnics, beach, and sporting events. Print your logo or brand name on the body to further boost your brand. These waterproof speakers are durable and reliable. With such qualities, you can be sure that your brand will be viewed in a more positive light as well.